Creamy, minty and packed full of healthy goodness…just in time for St. Patrick’s Day! I know many of you look forward to the green shake you can get from a drive-thru window this time of year. I used to like it, too. Honestly, I kinda miss it and I sometimes wish I could grab something quick while on the go. I’ve come up with a version that’s more in line with how I eat now. While not available at a drive-thru anywhere near me, it’s very quick and easy to make. It’s dairy-free and only six ingredients. I hope it brings you lots of luck! Combine all ingredients in blender and blend until smooth. This makes a very thick shake. If you would like a thinner consistency, add more ice cubes just a few at a time. 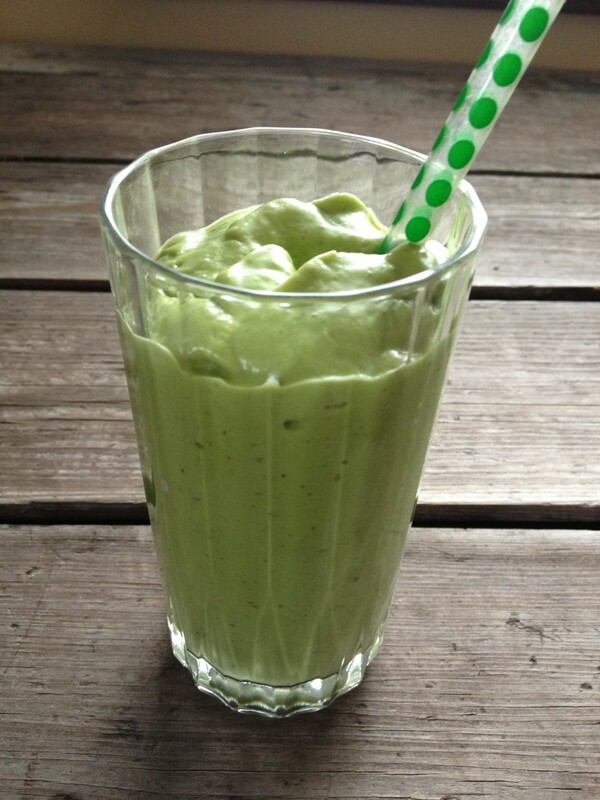 I’ve found I can’t do avocados in smoothies and shakes (too much saturated fat at once, even if it’s good fat, perhaps? ), but I absolutely love the velvety texture they offer to beverages. Your Shamrock Shake and mind are similar. Honestly, the fast food green shakes were never ever as good as our homemade ones, but I agree with you on missing the spontaneity and fun of indulging in them once a year. Yours sounds yummy, too, Shirley! I hear you on the saturated fat. My body doesn’t like the saturated fat in full fat coconut milk so I have to choose one or the other and not both in a smoothie, although the combination of the two is decadent. One day we’ll be able to get something that good at a drive-thru!